School’s out for summer. It’s about time. What an amazing yet crazy year this has been. Having an exchange student here for the whole year really has added to and enriched our lives. Yes, there have been some challenges and irritations, but we lucked out and had a wonderful girl living with us this whole school year. I mean REALLY lucked out. Tonight we are going to pick up her mom from the airport and she’ll stay with us for a few days. And hopefully soon I’ll have a new camera and can post all kinds of pictures again. Great weekend. Bring on Summer! What a great weekend! I wish they could ALL be this great. 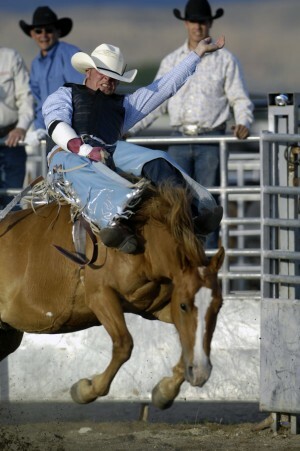 Saturday night we went out to Eagle Mountain for the Pony Express Days Rodeo. Rodeos are an American thing, and we thought Larissa would enjoy it, so we were glad to be able to find a rodeo so early in the season. It was windy, but not as windy as it had been the couple of days before. The bad part of the evening was that John really wanted a soda, so I told him he could have a Fresca from the back of the car. He stuck it in my purse, but not before starting to open it. I didn’t think it was open, so I wasn’t worried, but the bouncing around was just enough to make that soda leak all over my purse. And my camera that was in my purse. Ack. I took it out to take pictures, and the light blinked at me, but the camera wouldn’t do anything. Ugh. I took the batteries out and let it dry, but the next day it was still not working. I don’t have the best track record with camera. Probably because I take the camera everywhere, and it often gets dropped, splashed on, and generally abused. Still. With Cole gone, and Natalie can’t find her battery charger, we’re left with only Larissa’s camera and the tiny cheap one I got from a friend. Such is life, right? The Rodeo was fun. I really liked the clown at this one. There was a scary time when a rider hit hard on the ground, and they had to call out the paramedics. He was on the ground not moving for a long time. I sure hope he is all right. Larissa asked why the horses were bucking so much, and I had to explain about the strap that is placed in an uncomfortable position. Fun night. Although we were pretty much covered in dust and dirt when we came home. Showers for everyone! Sunday dawned early for some of us. I had to get up to the Tabernacle by 7:35, so that meant getting up at 6:00. I don’t see the Memorial Day Broadcast on YouTube just now, but it was a really great program. 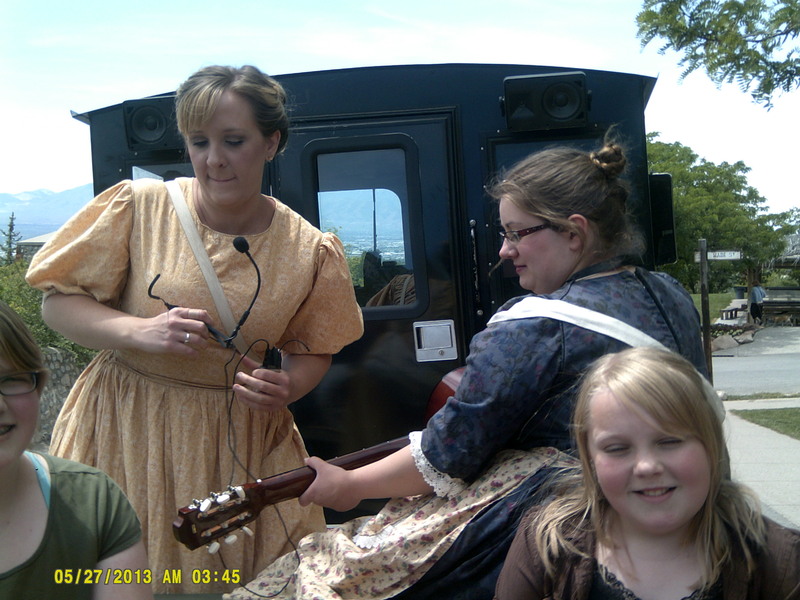 We played America the Beautiful and then played with the choir on a couple other songs. As I was sitting there on the stage, I almost forgot that we were there to perform. I was just so enthralled with watching the amazing orchestra RIGHT IN FRONT of me, with the Choir behind me. 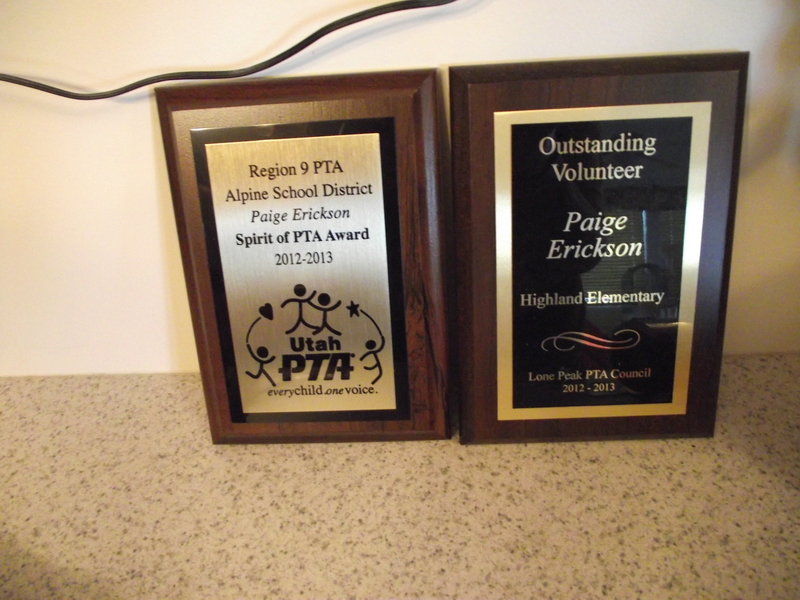 I love my calling! This is a busy week for us in bells. We have our spring concert on Friday, and that means extra rehearsals this week. 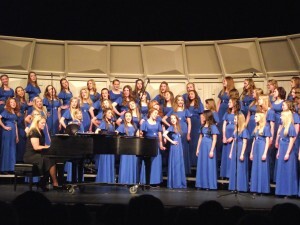 It’s always nerve-wracking right before a concert when we realize we are not quite ready, and things are not perfect. We do the best we can, right? After the broadcast, I made it back in time for the end of sacrament meeting, where it was the farewell talk for not one, but two missionaries. I just scooted into the back and heard the end of the last talk before going to nursery. The rest of the day was nice and casual, no other places to go. I had a much needed nap. Monday we did some garden work first thing. The kids even found a garter snake and we all took turns holding it and playing with it. It was just a little one, so not too scary. We let it go in the flower beds, so hopefully it will carry out it’s job of eating bugs or mice. We got the tomatoes planted, and Ryan’s bucket system is up and running again. I have also been sorting out Cole’s room. Sheets to wash, clothes to donate or pack away, etc. Larissa’s mom is coming to stay with us this Thursday evening, and that’s the room she will use, so I can’t put it off any longer. Luckily we was only in that room for three weeks after he moved home from school, so it’s not too entrenched with his stuff. Speaking of Cole, though, I’m quite disappointed that I haven’t heard from him yet. Wasn’t he supposed to write to us on that very first day? I even made him a mad-libs type letter that he just had to fill in the blanks, then put it in the addressed, stamped envelope and drop it in a mailbox. But here it is Tuesday, and we still haven’t heard one word from our missionary. This is going to be hard. 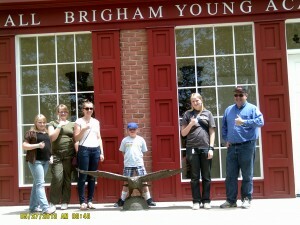 After lunch, we piled the kids in the car to go to This is the Place Heritage Park in Salt Lake. 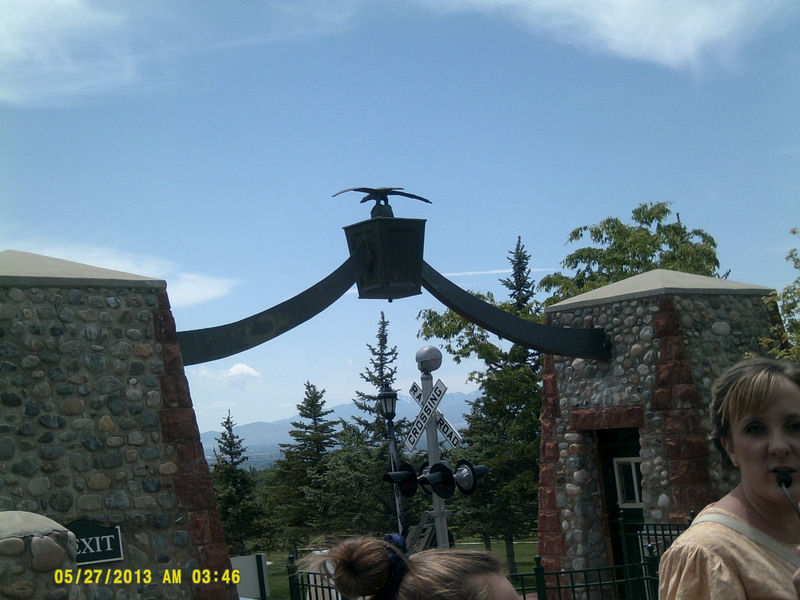 I haven’t been there in years, and I think I only had two or three kids when we went, so it’s been a long time, and they have made lots of changes. It was SO MUCH FUN! 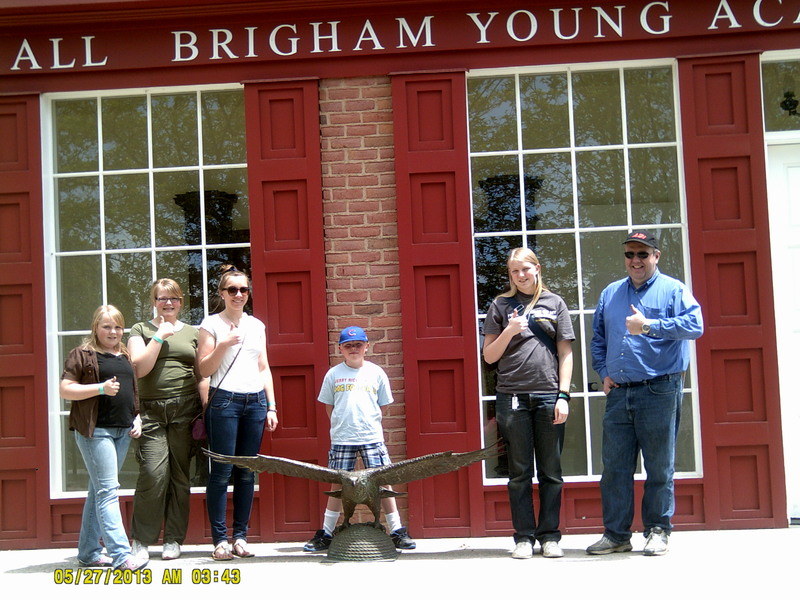 We rode the train, toured Brigham Young’s house, bought some candy at the ZCMI, made a craft at the furniture store, went to the leather working store and the kids pounded a little design in their leather. I don’t have many pictures (see above), but I may add some once I borrow the pictures from Larissa’s camera. 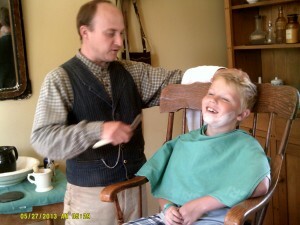 When we stepped into the barber’s shop, he had John hop up into the chair for a shave. After his “shave”, the barber suggested John might need a tooth pulled, or perhaps he wasn’t feeling well and might need some leaches, or other blood-letting. He declined. We had so much fun there, and it was the perfect day! Sunny, but not too warm, and not very crowded, since it’s just the beginning of the summer season. Since it was only $20 more to purchase a year pass, we splurged on that, and now we can go a few more times and enjoy all the things we missed. The kids had fun with the pony ride, and the petting zoo. There were even baby emus! And chicks. Of course, there were baby chicks. The kids all went gaga over the chicks! Then they were all BEGGING to get some. Do they not remember what a PAIN it is to have baby chicks? I guess not. Even Ryan was saying he wanted some chicks, and the guy walked by and said, “Oh, these are for sale.” No. We don’t need more Buff Orpingtons, thank you very much. Isn’t 5 enough for you? But we did get talking about buying some chicks….. Can you believe this is the same guy, who merely two years ago did NOT WANT chickens? This is CRAZY! 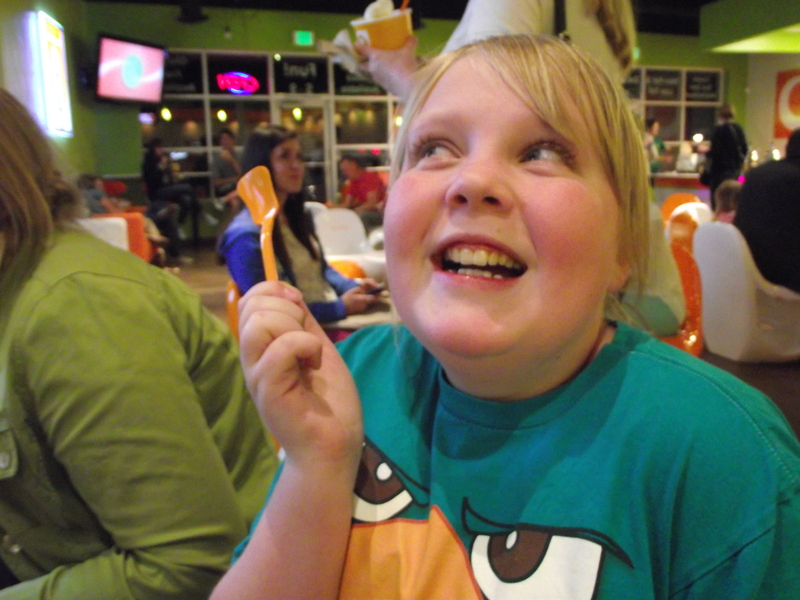 After we left the park, we went for dinner at Cafe Rio, which pleased MOST of the family. One of them wanted a hamburger, but he was voted down. Can you guess which one that was? The kids were so sweet, saying, “Thanks, Mom! This was the best Memorial Day EVER.” I don’t know about best ever, but it was a darn fun day. Just a few more days of “school” to get through this week, and then it’s full time summer break. Eek! I had better get myself organized or the chaos will take over. Last Sunday was Cole’s “farewell” talk in church. It was a super meeting, with a confirmation of a wonderful young lady who is currently living in our ward. Her baptism was the day before, and it was a wonderful experience. There was also a fabulous talk by a sister in our ward who was just released from her mission in Salt Lake at the family history library. 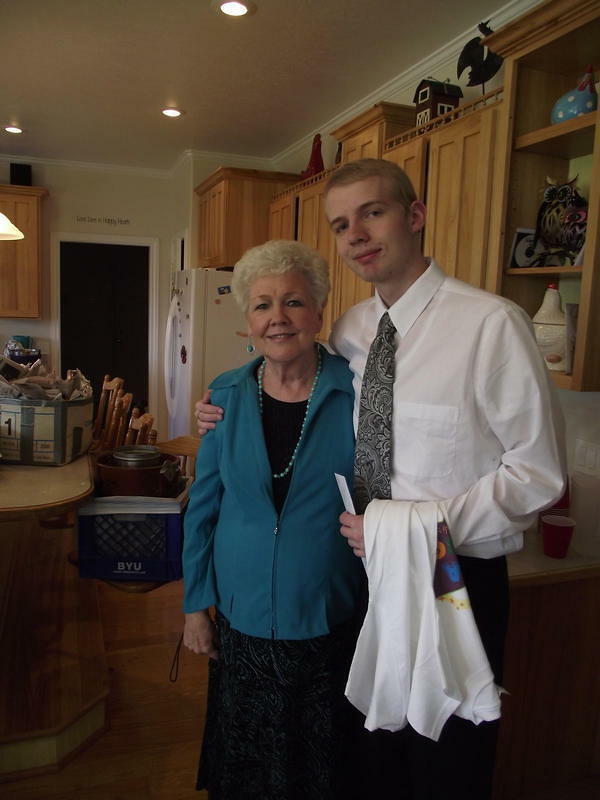 Her husband died while on their mission, but she was still so amazingly excited about missionary work. Cole also spoke. He did such a GREAT job with his talk, and didn’t get all sappy or make me cry. He spoke on the Atonement and his take on avoiding sin. Some things I remember from his talk are (and believe me, I was kind of emotional and don’t remember all that much), but he talked about harrowing, as in Alma 39:7 And now, my son, I would to God that ye had not been guilty of so great a crime. I would not dwell upon your crimes, to harrow up your soul, if it were not for your good. Definition of HARROW– a cultivating implement set with spikes, spring teeth, or disks and used primarily for pulverizing and smoothing the soil, so when you sin, the guilt from that sin is like something raking across your middle. He also said that if you enter into a minefield, you will explode. So stay far away from the mines of temptation. After the meeting, we were greeted by pouring rain. It was sunny when we left, and we had set up 4 tables outside, even putting tablecloths on them, so they would be all ready for our crowd. Well, we just had to get cozy inside. Here’s Cole with a bunch of his friends. 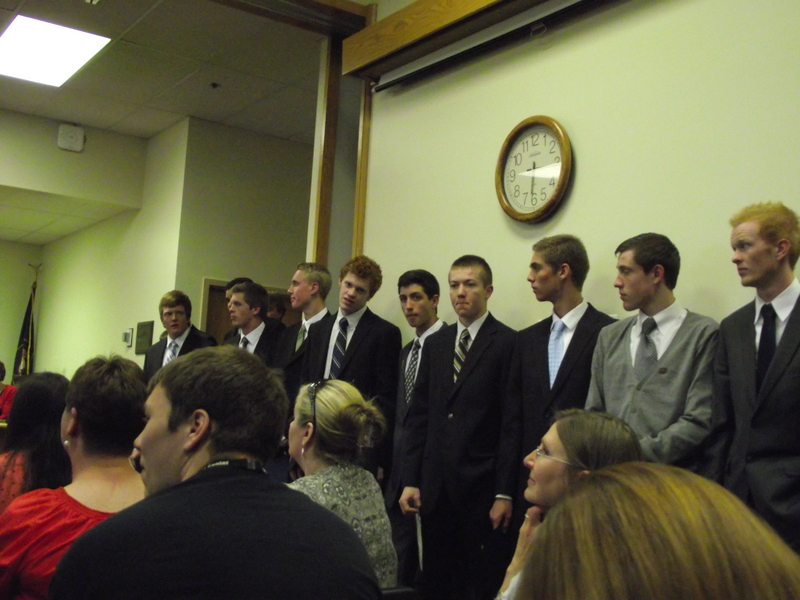 One of these friends had his farewell talk at 9:00 that same day. So these boys went to two sacrament meetings to hear each other speak. Lots of people, and this was just the family and friends who came over right after sacrament meeting. 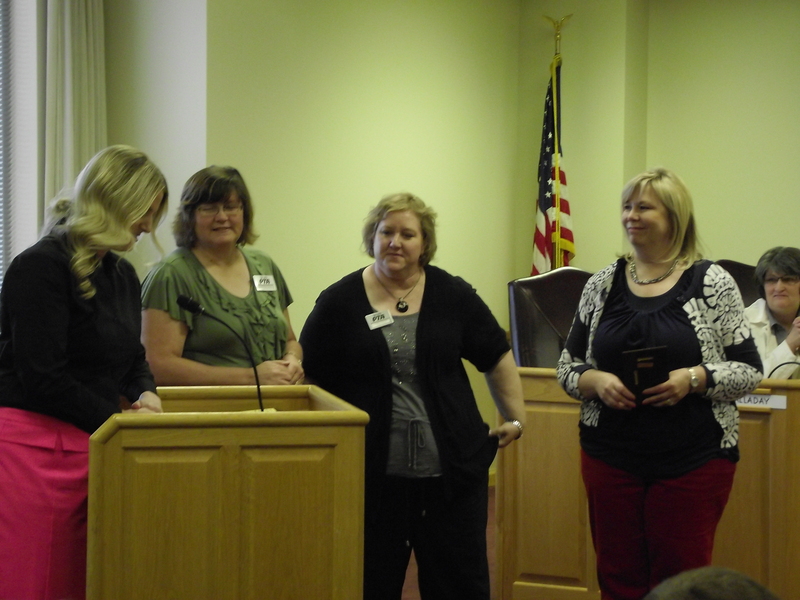 Luckily, we were set up in the basement, too, so we could spread out a bit. We had made an insane amount of rhubarb pie on Saturday. Well, 6 pies. I guess that’s not an insane amount. It just felt like that when we had all of the kids picking, washing and chopping it. There was actually plenty of food, so that when the ward members started to come over, we just got out something else. I bought too many rolls, but oh, well. Here’s Cole with my mom. Love them! Once the crowds left, my parents wanted to play a game, so we played… What was that game called again? King’s something? Anyway, it was fun to play with them. It was a beautiful day. I can’t believe it was only one week ago! 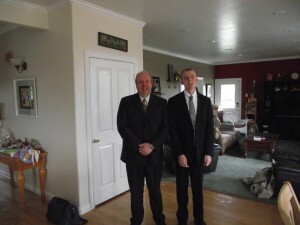 Instead of writing all about our trip to the MTC yesterday, I’ll direct you to the mission blog we have set up for Cole. It’s our last day with Cole here before he enters the MTC. So much to write about, but that will have to wait. He did a WONDERFUL job on his farewell talk, and we are SO proud of him. It’s been a wonderful weekend. If you’d like to keep up with Cole, you can follow along on his blog here. Tuesday seems to have become the new Friday, or day that we have so many things going on we can’t keep up with it all. Last night was an especially busy one. Ryan and I both went to work, and the kids went to school. Cole didn’t have work or school, but a list of things he was to accomplish while we were gone. One of those was to renew his driver’s license and get a copy of his driving record. 3:00-4:00 Piano lessons for Jenna and John (when I’m working, Megan gets to take the kids to their lesson. 3:40-I was finished with the long long day in Kindergarten, and instead of coming home for 10 minutes, decided to just drive to Natalie’s piano lesson to pick her up. I spent a blissful 10 minutes in the car with the window open, listening to her practice her recital piece, Beautiful Savior. 4:05-Natalie’s done. After talking to the teacher for a minute, I went to the other piano teacher to pick up Jenna and John. They had walked part of the way home, and were waiting for me in the shade of a tree at the Stake Center. 4:30-Ryan had gone to get his hair cut, and arrives home shortly after. 4:45-Cole’s friend comes over, and I send them both to go and pick up some Little Ceasar’s pizzas for dinner. 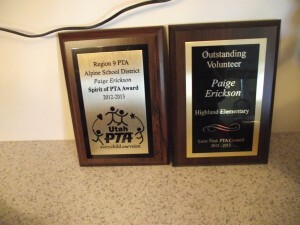 School District’s Region 9 PTA. We got there a few minutes late, but just in time for the start. The Lone Peak Basketball team was honored for their accomplishments this year. Besides winning a state and national championship, did you know they were named teen crush of the week by 17 magazine? Really. And they clean up nice, too. we waved to John on the baseball field as we drove past, and came home so that I could help Natalie with her hair for her choir concert. 7:00-Cole drove Jenna to YW, Ryan got started on his big ol’ conference call to India, and I tried to curl Natalie’s hair. 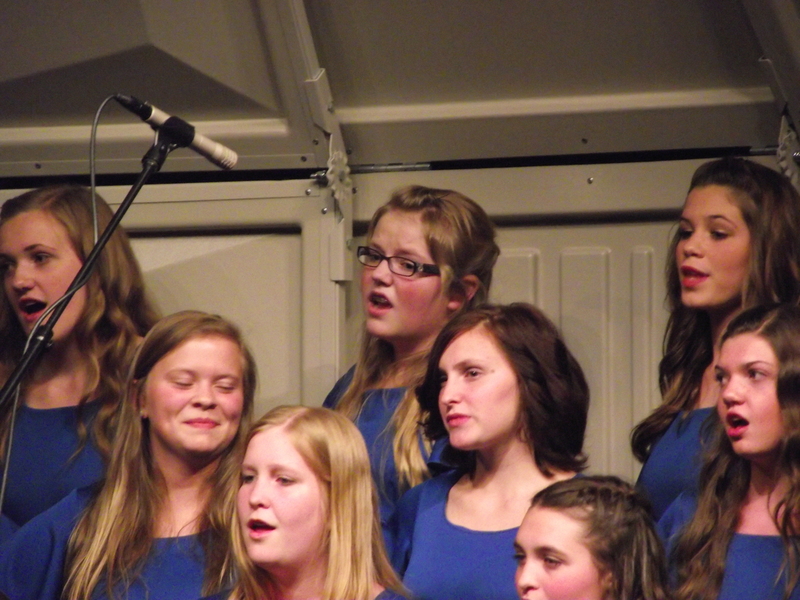 7:30–I took Natalie to her choir concert at the junior high. 7:45–I got a call from Larissa that they were done at the baseball game, so I called Cole to pick them up. He went and got them, dropped John and Larissa off at home, and then came to join us at the junior high choral concert. I was sitting by my parents, and had saved him a seat. He sneaked in after the first group just in time to hear Natalie’s group sing their numbers. 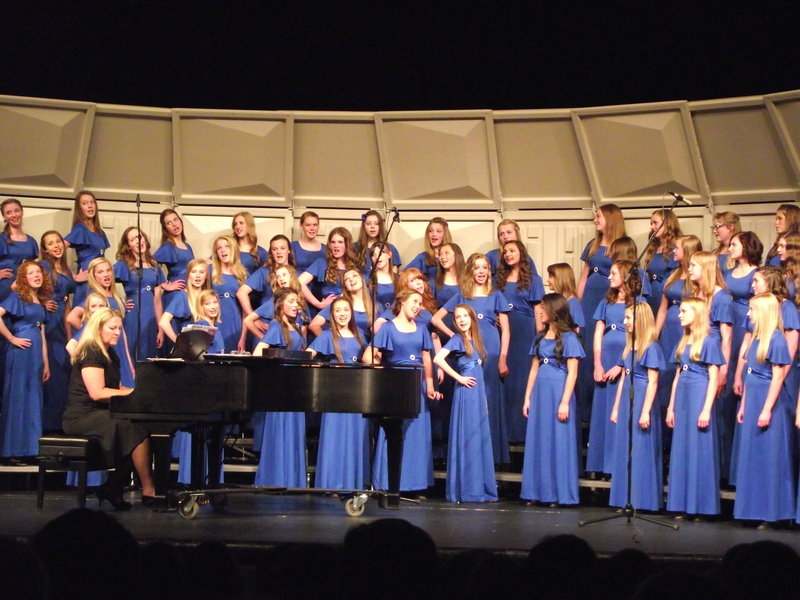 Lest you think the girls are being sassy in their singing, these pictures were from the Alto’s Lament song, which is so cute. At 9:30, we all came home. Except Megan, who was working until 11:00. Oh, the the activities that were missed were Peter Pan rehearsal and Young Women’s. Since we have moved here to the small community of Highland, it’s continued to grow, much to our disappointment. I’m sure it’s like that with all hidden gems. It’s ok for US to move here, but we don’t really want anyone ELSE to move in. When we moved here, there was one stopsign, now there are at least 10 stop lights at busy intersections. We have a Wendy’s, Little Ceasar’s, a flower shop, Pizza Pie Cafe, two gyms, and several other businesses. We’ve lost that small farming community feel, that’s for sure. There’s been a field behind our house since we moved in. First there were sheep there, then horses. On the map, it said the land was owned by Alpine School District, so we figured there may be a school there eventually. Then the property changed hands, and we got a notice that they were developing that land, and even saw the potential plot maps. We weren’t thrilled about that, but what can you do? Buy the land ourselves? Not possible. Right after that, the housing market took a dive, and I guess that developer couldn’t follow through, so we have lived a few more years with the happy field behind us, with no back door neighbors to worry about. Until this year. We got another notice in the mail about the lots being developed and all that blah, blah, blah. We didn’t see a sign, though, so we didn’t know when the lots were going to for sale. A friend from our ward told us that his brother really wanted to build back there. Then the trucks started coming. Lots of trucks and back hoes digging and digging and stirring up the dust and making lots of noise. A couple of weeks ago one of the developers came by to tell us they were going to put in a fence, and did we want them to leave up the existing fence (barbed wire? I don’t think so) and did we care if they ripped out those big ugly junk trees? Don’t need the silly fence, but I would kind of miss those trees. Yes, I know they are big ugly junk trees that cause my husband to sneeze (Russian Olives), but they are BIG trees, and provide us some shade. But since they are actually on the other side of the property line, they don’t technically belong to us, so I told them to go ahead and rip those out, too. Sure enough, a few days later we see this monstrosity out in the back and hear a horrible noise of crunching. I was afraid they were just going to plow down our chicken coop! But, no, they were just after the trees and fence. And just like that, the landscape of our backyard was changed. I wasn’t prepared for how empty things would look and feel without those big trees. WE realize that we need to get planting. We need to get that back area finished, with a way to water, and plant some trees back there! But hubby tells me we can’t plant anything until the fence goes in, so we’ll know exactly where that is. First it’s the trees, then it’ll be neighbors. Saturday we were finally able to go to the Temple with Cole. I had hoped we could go earlier in the spring, but he just couldn’t fit things into his schedule until he was out of school. Saturday night was the best time, so we met at the temple. We were all a bit nervous and excited, especially Cole. 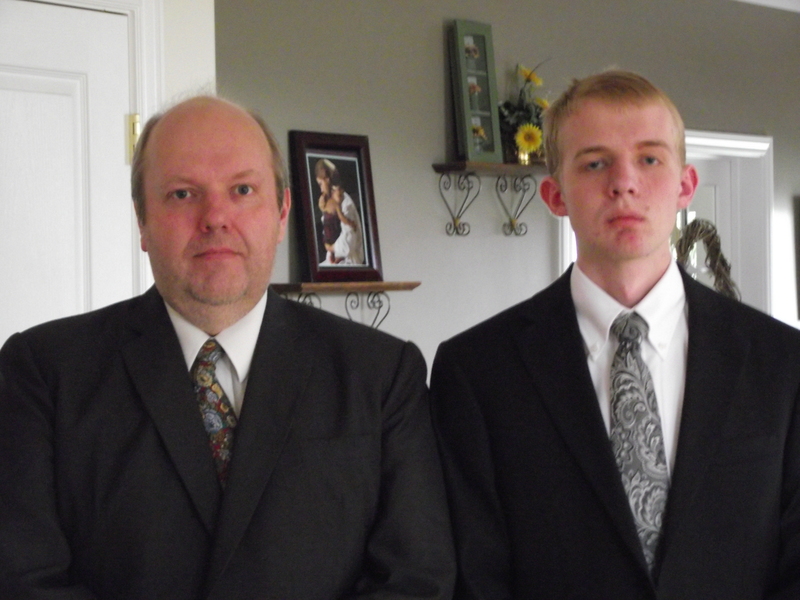 Ryan and Cole went to the temple at 5:30 (Don’t they both look sharp in their NEW SUITS?) and the rest of us met in the chapel at 6:30 for the 7:00 session. My sister, Amy, was going to bring her kids over at 6:00, but at 6:15, I couldn’t wait any longer, so I left, and told the kids she would probably show up with her kids to be babysat, but I wasn’t going to wait. Being in the temple with my parents, my family, Ryan’s parents and siblings and Cole was wonderful. I thought I would cry the whole time, but I didn’t. I was just very happy that we have a son who is worthy to go through the temple, and who is willing to the serve the Lord and the people of West Virginia. Happy. We had originally thought we would go out to dinner after the session, but then we thought twice about that. How about frozen yogurt instead? 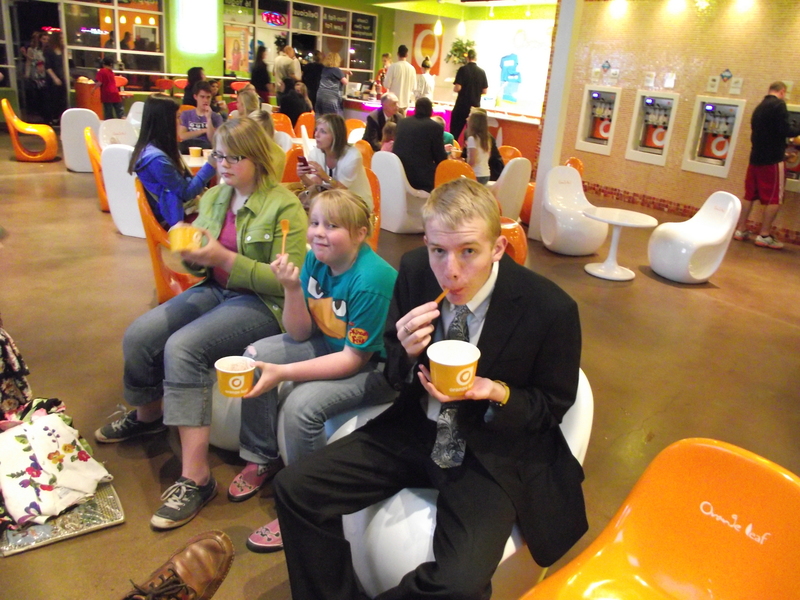 So, after the temple, we went back home and got the kids, who deserved a break after babysitting (Megan told me the kids were pretty wild and crazy), and went over to our local frozen yogurt shop, Orange Leaf. It’s one of those serve yourself places, and while I always make sure my own kids don’t load up on too much yogurt and toppings (try not to be greedy, right?) I cannot control how others load up those huge yogurt cups. 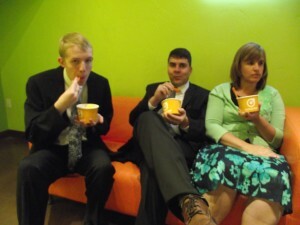 Ryan insisted we pay for everyone, and I was a little shocked at the price of yogurt for that many people. 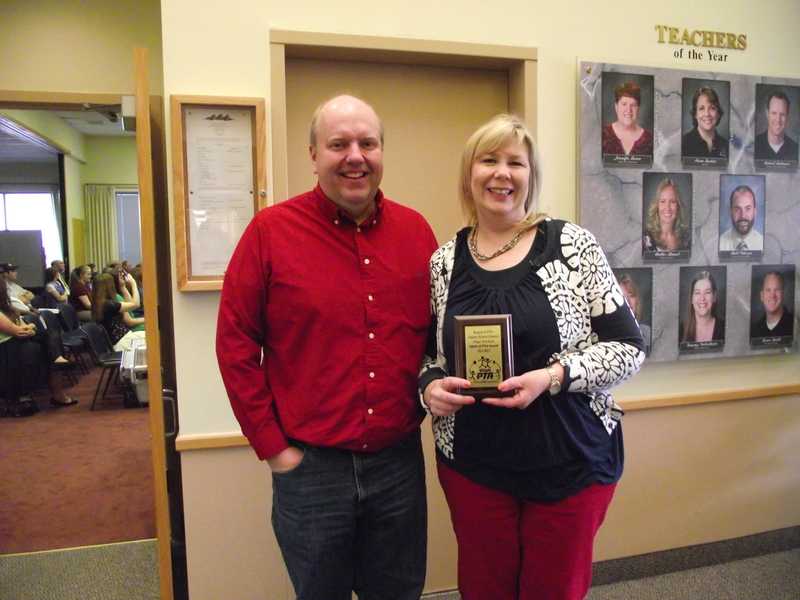 But, we had a nice time socializing with the family and friends who had come to share this special evening with us. So proud of my son and excited for the next two years.